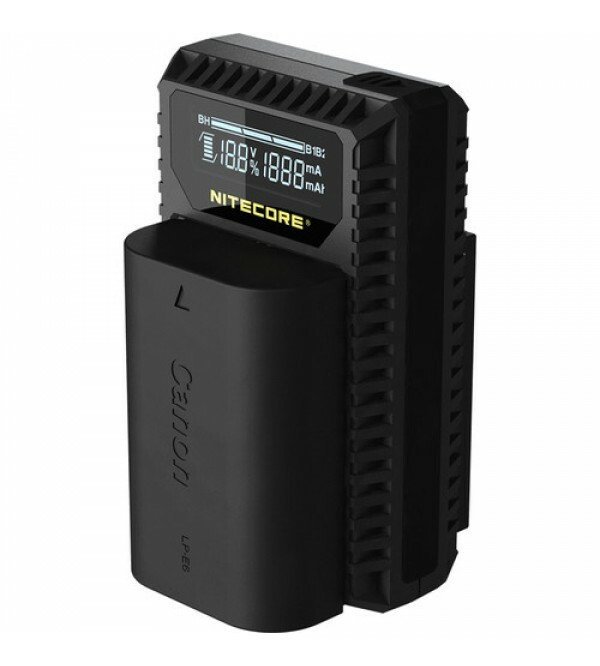 Restore power to your Canon LP-E6, LP-E6N, and LP-E8 lithium-ion batteries with this compact UCN1 Dual-Slot USB Travel Charger from Nitecore. It operates on 5 VDC input power, and features an attached USB cable that's stored in a trough to save space and prevent damage. The USB connector allows for connection to one of various user-supplied adapters, portable power banks, and solar panels. 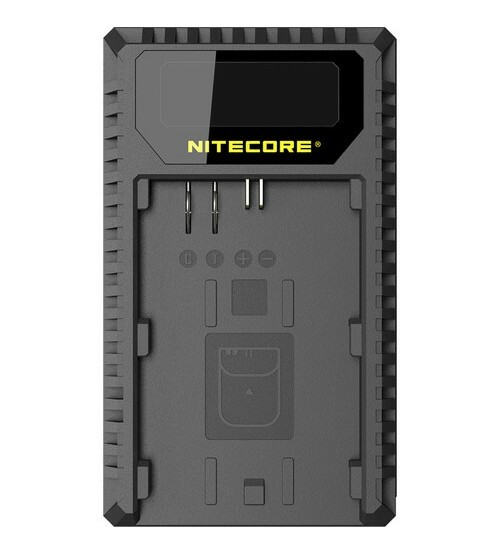 When used in conjunction with a fully charged 18650 battery, Nitecore's own F1 flexible bank will provide enough juice to charge two to three camera batteries to their full capacities. As an added convenience, the device has a second slot on the rear to accommodate a backup battery. The sophisticated UCN1 contains a smart charging management system, which monitors battery types, capacities, and initial internal resistance, then automatically applies the most appropriate charging current based on this data. The device also provides battery condition monitoring, carrying out a health inspection based on resistance at the time of installation. A cell's health bar will appear on the LCD display, which also shows capacity, voltage, and percentage of charge completed. When a battery's health has declined to the lower limit, the bar will start flashing to alert you that it should be replaced. 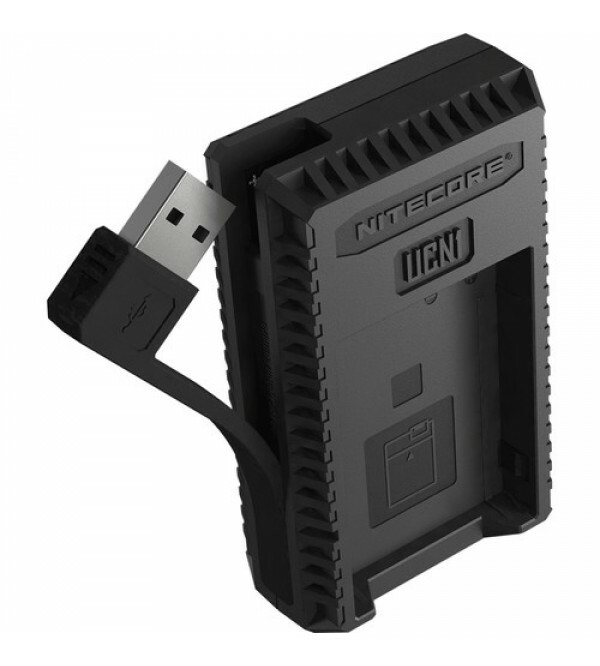 The UCN1 offers a mechanical reverse polarity protection mechanism that prevents charging from occurring if an incompatible or incorrectly installed battery is present. Additionally, the error message "EE" will appear on the LCD to notify you in the event that a short-circuited battery is detected. Yet another helpful feature is the battery recovery mode that restores dormant cells to active duty. Built for durability, the UCN1 is made from polycarbonate and ABS plastics that are corrosion-resistant and fire-retardant. When this toughness is coupled with the convenient compactness and considerable versatility of the UCN1, the result is a charger that's ideal for travel, camping, and almost any other adventure in your life.